One of the most important numbers to understand when it comes to making smart sourcing decisions is sales rank. 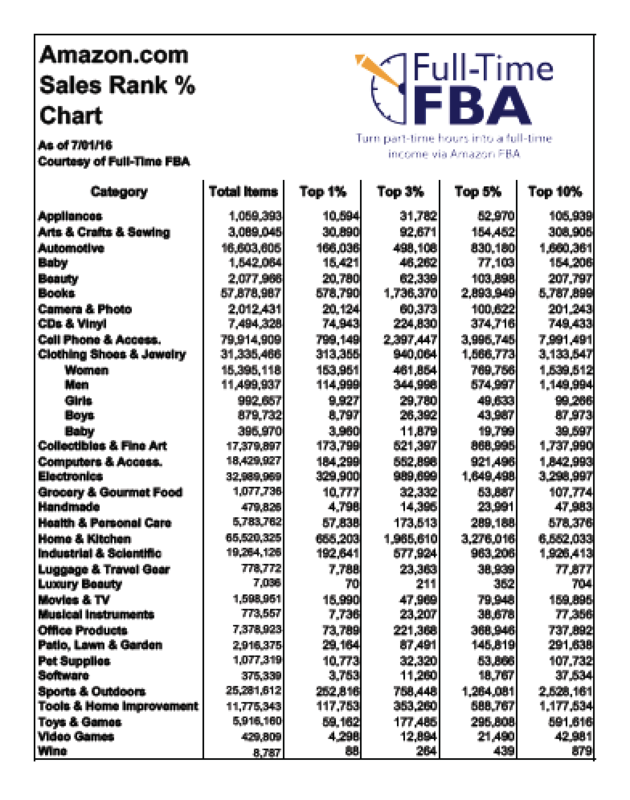 The closer the sales rank number is to #1, the faster an item generally sells. But here’s the problem: Each of the main product categories on Amazon have their own “personality” when it come to sales and sales rank. A book with a sales rank of 500,000 might sell a few times a week, but a toy with the exact same sales rank of 500,000 probably sells only 4 times a year. Since defining a sales rank as “good” or “bad” can be very different depending on the product category, I’ve come up with an Amazon sales rank chart that makes this task a bit easier. The sales rank chart is now available to you for FREE. 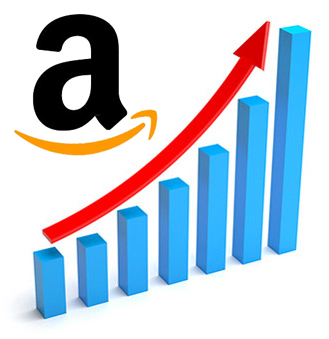 I offer you a sales rank chart for not only Amazon.com, but also Amazon.ca (Canada) and Amazon.co.uk (United Kingdom). The sales rank chart is divided into all of the main product categories on Amazon (and a few main sub-categories). Then each category is calculated into columns that show the top 1%, top 3%, top 5%, and the top 10%. Some people like to only source in the top 5%, while others like to focus on only the top 3%. Still other sellers will broaden their sourcing parameters to the top 10% if the ROI (return on investment) is high enough. I like to source the top 5% in some categories, the top 3% in other categories, and the top 1% in still another category. I almost never source an item within the top 6-10% range. But everyone has a different business model when it comes to sourcing. If you click the yellow button above or below, you can have a FREE PDF emailed to you that contains every main Amazon category broken up into the top 1%, 3%, 5%, and top 10%. When you click on the link above or below, you’ll not only get the sales rank chart, but you’ll also be added to the Full-Time FBA mailing list. At least once a week, I promise to send you the latest strategies, tips, tricks, video trainings, walk-throughs, coupon codes, resource recommendations, and so much more to help you take your Amazon business to the next level! I promise I will only send you blog posts and information to help you get closer to turning part-time hours into a full-time income via Amazon FBA.